Status: Rare casual spring migrant. Documentation: Photo: 15 May 2002 male 5.5 miles north of Creighton, Knox Co (Brogie 2002, 2003). This species and Townsend’s Warbler hybridize commonly in the Cascade Mountains of Washington and Oregon (Morrison and Hardy 1983). There are two other undocumented reports, both of which may be correct. A “possible” Hermit Warbler was reported at NNF Bessey 26 May 2002. Two birds seen in McPherson Co 21 Sep 1973 were described briefly (Bassett 1974); while suggestive of this species, the description did not adequately eliminate Black-throated Green Warbler, which it resembles in fall (Bray et al 1986). Most records from nearby states are in spring, in the period 24 Apr-17 May. On the Colorado plains there are seven records 24 Apr-17 May and one in fall, 8-11 Oct 2012 (Andrews and Righter 1992; eBird.org, accessed May 2018). The single Kansas record is 7 May (Thompson et al 2011), and the two Minnesota records are 3 May and 14 May (Janssen 1987). Other than the fall record for Colorado (above), there are fall records for Missouri, an immature male collected in the extreme northwest part of the state on 20 Dec 1969 (Robbins 2018), and Chicago, Illinois, one present 9 Dec 2001-3 Jan 2002 (eBird.org, accessed May 2018). Photograph (top) of a Hermit Warbler at Crescent Lake NWR, Garden Co 21 May 2010 by Cory Gregory. Bassett, O. 1974. 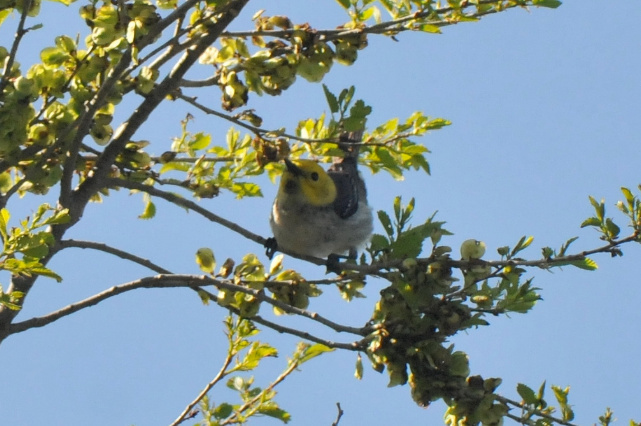 Hermit Warbler reported in Nebraska. NBR 42: 42. Brogie, M.A. 2002. Hermit Warbler in Knox County: First accepted record for Nebraska. NBR 70: 119-121. Morrison, M.L., and J.W. Hardy. 1983. Hybridization between Hermit and Townsend’s Warblers. Murrelet 64: 65-72.